It’s like a dream is coming true: You decided to say ‘YES’ to each other. And such a special occasion like a wedding asks for a very special celebration. To plan a wedding is quite a lot of work: There are just so many things to think about! 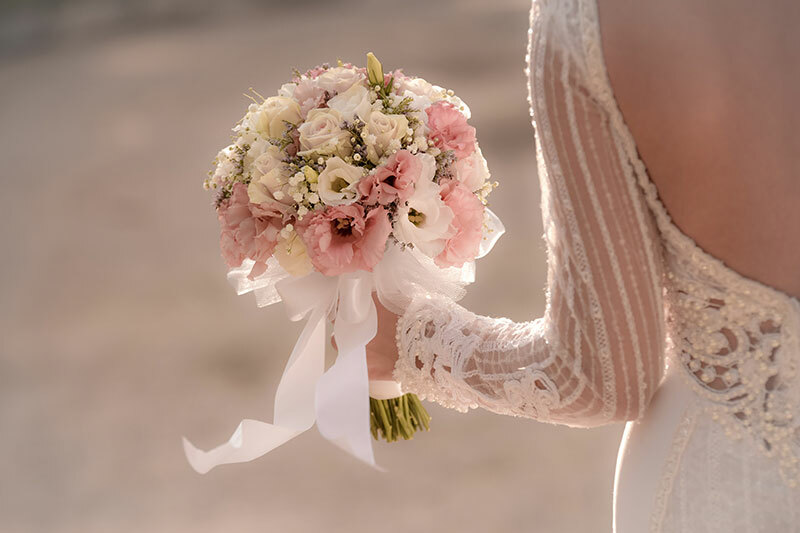 Such a lot of providers can be in charge of a variety services for the bridal couple: Starting with a Photographer, stationary, flowers, hair- and make-up-styling, … but one very crucial question stands at the very beginning: Which is going to be our location of choice? Maybe one of the elegant halls of Hotel Am Schloss Aurich might be the one you choose. In us, you have found a good partner for very many topics concerning the big party. Set up an appointment with us, so that we can together already answer quite a few questions. The Hotel Am Schloss is located very close to the pedestrian precinct and the city center of Aurich and can therefore be reached easily also by guests ariving from a far. There are many rooms and a lot of parking spaces. Some of the most beautiful photo shooting places of the old town are at a walking distance. Depending on the number of guest you are planning to invite to your wedding our house provides different halls: . Any questions concerning the food selection you can put in our professional hands. The chefs working in our gourmet-kitchen will prepare the finest dishes for you and your guests. You only have to choose: Would you like a self-service buffet with all kinds of tasty treats? Or do you prefer a seated menu with several courses? Modern and popular is also eating ‘Family Style’. It is our goal to grant your every wish to make the celebration an unforgettable event. Don’t hesitate to get our unbinding advise! Classically-elegant weddings are hosted in our big Störtebeker-Hall. The grand hall has breathtaking 7 meter high ceilings with almost as long windows, that fill it up with daylight. The ceilings are decorated with stucco and glass chandeliers, that light up the room beautifully in the evening hours. The seating opions vary. Very popular for familiar occasions are the splendig round tables for up to ten people. The chairs are comfortably padded and are of a noble bordeaux and off-white colour. For party and dancing the Störtbeker-hall has the best requirements: Standing tables to open up the atmosphere, high-quality wooden floors, a stage and air conditioning. If you wish for it, there is also a grand piano available. Come visit us and take a look yourselves. We are looking forward to your meeting requests! Phone: +49 4941 / 95520, via E-Mail or contact form. The maybe most modern event hall all over Eastfrisia is our ‘360 degrees’. It lies under a glass cupola that is decorated with a star constellation. The minimalistic LED light system is unique, venetian blinds allow an extensive obscuration. To celebrate here the optimum number of guests lies around 50, sitting at round tables with each 10 people in a familiar atmosphere. Also the ‘360 Degrees’ is equipped with comfortable chairs, standing tables, wooden floors, and airconditioning. A special highlight is the in-room bar and the modern illumination system. Please visit us to get a personal insight and don’t hesitate to make an appointment for a consultation talk with us! Wedding Planner: Profit from our experience of many years in the event business! 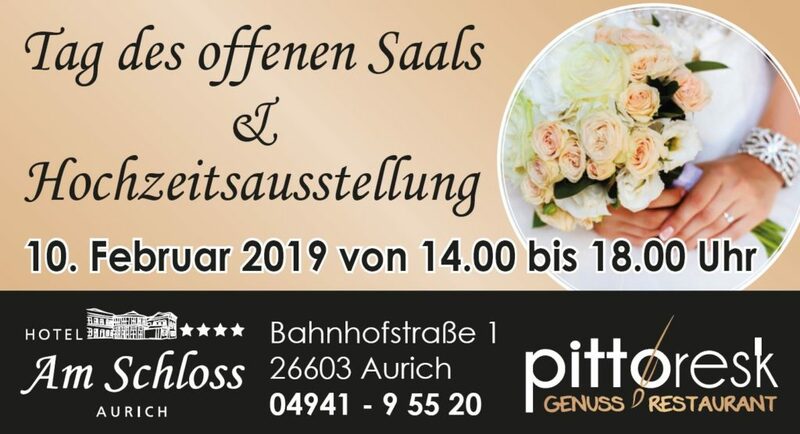 In the heart of Aurich: What about wedding photographs in the castle garden? Food is Love:Our chefs would like to spoil you by every trick in the box.